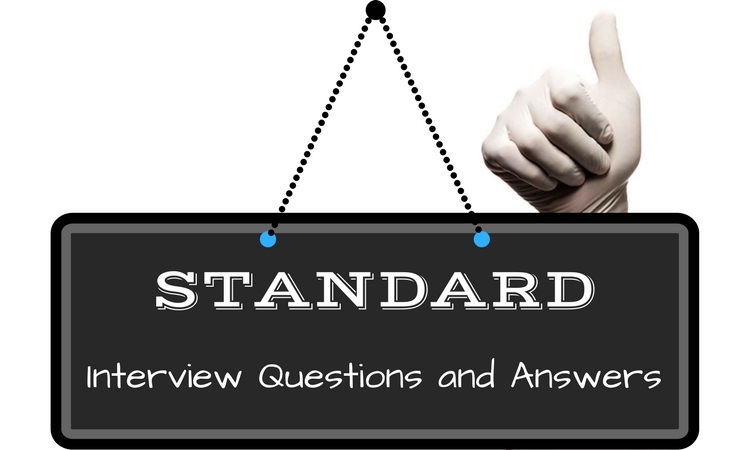 Answering the interview questions is the one of the most difficult situation faced by a candidate. It would be such a relief if the candidate knows the question that the interviewer is going to ask him. Different interviewer ask different type of questions and there is no perfect answer for every question but still there are certain guidelines that can be followed to answer these questions. Here, is the list of some of the questions, which are commonly asked in an interview. Usually candidates don’t prepare for this question as it seems to be a simple question. While answering this question the candidate shall not give his complete employment and personal history, instead he shall describe his qualities as to why he is perfect for the job. The candidate shall highlight his accomplishments which shall be of the employers notice. To end, he shall specify the reasons why he left the previous job. 2. How did he get to know about this job? This is just the perfect opportunity to stand out from the crowd and show your smartness. Clearly tell the source from which you got to know about the job and name it if necessary. If the source of knowledge is some link or site then, share the reference about the same. If the source of knowledge is some other written board or something else, then do specify the details of the same with the interviewer. 3. What is level of knowledge of the candidate about the company? In the fast paced world of internet every candidate has an easy access to the details about the company. Through this question the interviewer wants to know whether you care enough about the set goals of the company. The candidate can start answering the question by using some standard line about the company but he shall proceed with the details by personalizing the answer. Depending upon the job, the examples can be given accordingly. 4. Why do you want the specified job? Companies are looking for people who are passionate about their job. While answering this question the candidate shall highlight his passion for the job. Make use of certain key factors that make the job a complete fit for you. Also, highlight why you love the company and check whether the goals of the company are similar to your professional goals. Give reasons which satisfies the interviewer’s curiosity that while achieving your goal, you will achieve company’s goals as well. 5. Why shall the company hire the candidate? This question seems absolutely straight and is the direct way to sell yourself to the interviewer. Here is the golden opportunity for the candidate to put across three important things, firstly, that you cannot only do work, secondly, you can deliver great results and lastly, you can blend well with any team and culture. So, it is always better for the interviewer to hire you rather choosing any candidate. By answering this way, the candidate always stands a better chance to get the job over others. 6. What are the professional strengths of the candidate? To answer this question many interview experts suggest to be clear and straight rather than pretending. The candidate shall highlight those qualities which are actually owned by the candidate rather than what the interviewer wants to listen. The candidate here can support his answer with suitable examples. Have more persuasive skills and relationship skills. 7. What are the possible weaknesses of the candidate that he would like to highlight? The interviewer wants to see the candidate’s honesty and self awareness about himself. The candidate shall be smart enough to strike a balance between his weakness and his efforts towards overcoming his weaknesses. For instance, the candidate is shy of public speaking but he is conducting public appearances and trying to overcome his weakness. 8. What are the professional achievements of the candidate? The candidate shall not shy to highlight his achievements from the past. One the best way is the S.T.A.R method where the candidate first sets up the situation, what was expected of the candidate, the steps that he has taken and the results that he has actually achieved. Also, highlight the way it has been beneficial for the company and saved on the resources. 9. Any conflict that the candidate has to follow at the workplace and how he dealt with it? The interviewer wants to know the way the candidate will deal with the conflict while the work is still in the process. The candidate has to follow an approach, the way he deals with this situation without affecting the work environment. The candidate shall support his answer with an example from the past situation of the workplace. 10. What are the future plans of the candidate? While answering this question the candidate has to reveal his actual future plans rather than any plans which can’t be achieved. The interviewer wants to know how real approach does the candidate has towards work. The candidate’s answer will reveal his future growth. To actually see where the growth will take him along the lines will be helpful to him. If the candidate is not sure then he shall tell the interviewer about this. 11. What’s the dream job for the candidate? The interviewer here wants to interrogate the candidate whether the offered job merges with the dream job of the candidate. The candidate here shall talk about his dreams and goals that he has set for himself and how this job is going to help him in achieving this. Importance of the present job for the candidate will make the interviewer confident about the candidate. 12. Which other companies the candidate is interviewing with? The interviewer here wants to know what is competition for the candidate? and whether the candidate is serious about the job or not. The best way is to reveal that the candidate is exploring other companies as well and the nature of the work for all the jobs is similar. This way the interviewer can have faith in the quality and the ability of the candidate. For example a candidate is applying for job in several IT companies but, the nature of the job is similar for all the jobs. 13. Why the candidate is leaving his current job? This is one question that every candidate has to face in an interview. The candidate shall not frame a negative picture about the previous employer rather he shall show eagerness about the new job opportunities. The present job is better than the previous job and will be helpful for achieving his future goals. 14. Why the candidate was fired from the previous job? The best way to deal with this question is to reveal the truth as the business world is very small. The candidate shall present the truth whatever may be the reason. Instead he shall lay stress as to how he has grown both personally and professionally. The present job will help the candidate to evolve as a better person on both the fronts. The experience from the previous job will be only helpful for the candidate. 15. What are the expectations of the candidate from the present job? The candidate shall be straight and specific while answering this question. Whatever the job has to offer shall be the expectation for the candidate. The job shall be the one that candidate has always wanted and will be completely dedicated towards his work and will work for the progress of the company. 16. What type of work environment is suitable for the candidate? The candidate shall specify the work environment of the company as the one desired by the candidate. The work environment of the company is just the one the candidate has always desired. 17. What’s the management style of the candidate? Managers are strong but they are flexible in their job. The candidate shall show that his way of dealing with different situation is completely different. He can support his answer by giving some instances from the previous job. This way, the candidate can show his flexibility and his way of dealing with situation. 18. In what situation the candidate will exercise his leadership skill? The candidate shall reveal the instances from the previous job as to how his leadership skill has helped to improve the previous job performance. The situation revealed shall be believable and true, if cross checked by the interviewer. The answer shall present the candidate as the hero of the situation. 19. When was the last time the candidate disagreed with decision at the workplace? Any candidate will not always agree with the decision the boss will make, but don’t show the times when you disagreed with your boss and you were a jerk. Instead show those times when your disagreement with the boss has brought a positive outcome and that your boss was proud of you. This will build confidence of the interviewer and the candidate will emerge as a strong personality. 20. How will your previous boss and coworkers will describe you? Be truthful in your answer because if you get the job then your boss will cross check it with him. Strongly bring out the traits of your personality which have not been described as yet. Qualities like strong work ethics and ability to adjust with others for better work performance. Increasing your pitch, when required for the betterment of the company and to achieve the desired result. 21. Why does, the candidate took a gap between the two job employments? The candidate shall respond to this question truthfully. He shall clearly state the reason of gap between the two employments. Be sure to highlight that you were busy taking classes or improving upon some aspects of your work process. How working on your qualities will contribute to the present job and help in achieving the desired results. 22. Give reasons for changing career paths? Don’t panic on hearing this question and calmly answer this question and explain why you changed career paths. Explain the interviewer how your experiences are responsible for change in career paths. This is one of the ways to impress the interviewer about the flexibility of the candidate. 23. How does the candidate deal with stressful situation or pressure in work area? The candidate shall answer in such a way that he can deal with the situation in a productive and positive manner and nothing can bother him to achieve the goals of the organization. Support the answer with the experience from the past. 24. What are the salary expectations of the candidate from the job? The candidate shall have done the required research about the similar jobs and what they are paid. The candidate can suggest a range from which the salary can be given to the candidate. An important point to be noted is that the range shall depend on the qualification, experience and skill of the candidate. 25. What are the places of interest for the candidate outside the work area? The interviewer asks this question to know whether the candidate can fit in the culture of the company and can blend with other employees working in the company. The candidate shall tell all the things which actually make him get started. But the candidate shall be a little careful while talking about his place of interest. 26. What are the things that the company could have done better? This will reveal that how much the candidate has researched about the past of the company. Also, how he thinks about the work process of the company. A candidate can come across a variety of questions while he appears for an interview. The best way to succeed in an interview is to be honest and give the interviewer what he is looking for and that are the requirements of the job.